Villa in Kalkan, Turquoise Coast of Turkey - Situated In The Peaceful Area Of Kisla, On The Outskirts Of Kalkan, Only 100 Yds From The Sea! *NOTE to our lovely guests! New mandatory Turkish Law requires a copy of your passport or Official I.D. sent to the OWNER well in advance of your travel date! Your cooperation really appreciated. * A safe for valuables is found upstairs in your villa! Installed last year an efficient powerful WiFi system throughout the villa with Cable TV on a new flat screen. Villa Angora has a modern kitchen that is fully equipped. Our management company offers to supply the villa with a short shopping list for your first morning, just let us know details ahead of time. Enjoy cocktails on the top-deck to witness fabulous Turkish sunsets over the mountain sheltered bay. Just below the property are two Private Beach Clubs with full amenities accessible to Villa Guests, offering secure privacy & safe swimming or snorkeling at no charge. Our villa is within a 30 minute walking distance to the beautiful town centre (need to be in good shape for that one!) or better still a 5 min taxi ride costing £5 each way with drivers who know us well, their contact we can supply. Our favourite fun way of reaching town center being the water-taxi (costing a mere £3 round trip) from the Beach Club just below the villa, an easy 5-minute walk! Car & scooter rental from town centre by the day for those who like to explore and visit the wonderful local area attractions of which there are several not to be missed. A must-do day exploring fabulous Saklikent Gorge or ancient Xanthos and on to Tlos with its 5000 year heritage sites! World famous Patara Beach (the longest in Turkey!) where you can walk first through the ancient Roman Ruins just a 15 minute drive from our villa! (Take a camera!) There are two restaurants & bar holding a small convenience store 2-3 minutes behind the Villa, guests have no need to leave the area for days if they wish! We gladly will arrange your airport transfers & car rental with reliable friends in the business in Kalkan if you wish? Parking available on our street in front of your villa. There are near 150 restaurants and shops in the old town of Kalkan with quaint narrow cobbled streets lined with gorgeous flowers and trees. Variety for ALL tastes guaranteed! Our proud local management company will take care of any special needs or assistance while you stay with us! A retired commercial seaplane pilot, artist, author & wildlife photographer living between the Bahamas & Kalkan! Having traveled the globe extensively with my businesses I have gathered uncountable experiences about so many countries. The stunning vistas I have found on the southwest coast to Turkey, along with the wonderful friendly hospitality we experienced, made this a favorite holiday destination! I love the less commercial location of Kalkan, Turkey, just far enough away from the more crowded tourism areas of that region. The town is surrounded by stunning historical attractions and nearby townships of interest. A beautiful beach boasting the blue Mediterranean Sea is just 6km away and the longest beach in Turkey just a 16km drive northward. Kalkan town is made of quaint cobbled streets with unlimited dining experiences and fabulous shopping. The Turkish hospitality is wonderful to experience and most speak great English! Kalkan is just an hour & forty minutes drive from Dalaman Airport which is an easy 3 1/2hr flight from London/Gatwick! Villa Angora is located in the very desirable, less commercial part of Kalkan in the nearby region of Kisla on the hillside with easy access to the town centre merely minutes away and in full view. An attractive feature I love is the fact you can stay in the immediate area for days without having to leave! You don't even need transportation during your whole stay if you chose? Taxi rides from town to the villa are only about 5 minutes or the lovely water-taxi across the bay that runs all day! A five minute walk down the pathways from the villa take guests to two Private Beach Clubs offering free amenities to villa guests where they can swim or relax in comfort, safety and privacy. Just behind the villa is a couple of great restaurants and 'Bob's' small convenience grocery store. The views from all parts of the villa are just stunning while overlooking the blue bay of Kalkan Harbour! Our villa is fully air conditioned, the kitchen fully equipped and beds really comfortable! The WiFi signal has been upgraded and throughout the villa. Enjoy programming on a flat screen TV and being able to dine both inside or out on the poolside patio. Your hosts know the area well and can steer you toward some really wonderful local experiences from the local market on Thursdays to exploring fabulous Saklikent Gorge or the ancient Roman ruins of Patara! Villa Angora has a wonderful local management team who will prepare your villa prior to arrival and be at your need while on holiday in Kalkan. Enjoy your stay with us! Paul & Melissa. En-suite to bedroom 1, with Shower, WC and pedestal washbasin. En-suite to bedroom 2, with Shower, WC and pedestal washbasin. Separate WC on ground floor with pedestal washbasin. Fully air conditioned throughout the villa. Full Linens with laundry services if requested at extra cost. Safe parking just outside the entrance gate of the villa. Full wifi service throughout the villa with password provided in information sheets & on the refrigerator door! Lounge comprises comfortable sofas and chairs, TV, DVD player, CD player, Ipod Dock, with access to pool terrace, kitchen terrace, and leading into kitchen. Stove & oven are propane gas equipped. Fully fitted kitchen includes, cooker, hob, fridge/freezer, washing machine, dishwasher, electric kettle, toaster & French press coffee pot. Indoor and outdoor dining facilities seating up to 6 persons. A few paperbacks in the villa. Feel free to donate when you leave! Paul's best-selling autobiography available for a fun read (found on Amazon) Please do NOT remove from the villa, thanks! We have left some DVD's below the TV for you. Thursday Market Day has a great selection of up to date DVD's for sale at very reasonable prices! A small garden around the sides and rear of the villa. Nice lemon tree and shade trees. There are about a dozen steps up to the villa from the road entrance. The villa is three stories with stairs to each floor. There is no shallow end so small children & non-swimmers will always require supervision please!! Outside: The ground floor exterior comprises a sun terrace with sunbeds and umbrella, and its own private pool, measuring approx 10 metres x 3 metres, with a constant depth of 1.75 metres. (Children and non-swimmers will need supervision). There is an additional roof-top terrace offering stunning views and wonderful sunbathing opportunities. Cleaning / Towels / Linen / Maid service: Linen and towels are provided with pool/beach towels. PLEASE leave at the villa as towels can be found at all the major beaches! The villa will be thoroughly cleaned before arrival, but is not normally cleaned again during your stay (1 or 2 weeks). However, should you wish to have an interim clean, please speak to our caretaker. Other: Fully fitted kitchen also included glass-top dining table, and provides access to garden and kitchen terrace, where there is an additional outdoor covered dining area with table and 6 chairs. we have stayed in Kisla several times but this villa was in the best situation. Not too far from the sea but high enough to get great views. The villa itself is a little tired and could do with some updating but we didn't spend much time in it. The roof terrace was lovely. The main bedrooms were a good size with shower en suites but I'm not sure who I would put in the third bedroom, which is accessed from the roof terrace (and therefore very high) and has a very low ceiling. Maybe teenagers but definitely not children. The outdoor space was nice, with 6 loungers. We thought the villa was good value and would book it again. Lynn from the management team was great and very helpful. She got some shopping for us to arrive to. Thank you for the review and glad your time in Kalkan a good one, we look forward to your return! FYI the villa interiors are being updated during this off-season and ready for the 2019 guests! We stayed at Villa Angora for 2 weeks, from the moment we arrived it felt like home from home, the management team were so great, nothing was too much trouble. Paul and Melissa, the owners, were so helpful whilst booking, responding to our queries so quickly, recommending areas of interest enhanced our stay, we visited some beautiful locations, which, we are sure we would have missed, had it not been for their help. Great holiday with great memories. What a lovely review and thank you so much for staying with us in Kalkan. It would certainly be our pleasure to have you come back for many a return visit and experience even more fabulous places & people to meet! 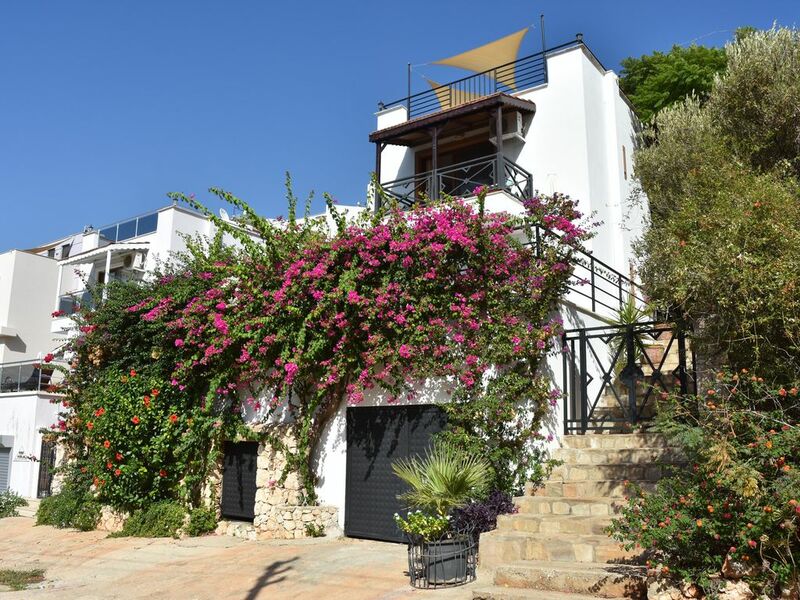 Older style villa in Kisla area of Kalkan with beautiful views over the bay. Spotlessly clean and plenty of storage space. Good showers. Just a few minutes walk to the sea and easy ( uphill ) walk back. Owner very helpful and quick to respond. A very enjoyable stay. Thank you Jane for the review and so very glad your holiday went well in our villa! We would love to have you come visit Kalkan again and wish you many happy returns & safe journeys always. A lovely Villa with fantastic views over the bay. We had a wonderful family holiday stating in the Villa Angora. It is a great villa if you have teenagers as the beach is really close, and there are lots of activities down at the various beach clubs. The views from both the pool area and the roof terrace looking across the bay are fantastic and we enjoyed having a evening BBQ looking over the water as the sun went down. We watched the Lunar Eclipse sitting up on the roof terrace and it felt a privilege to be experiencing it in such a lovely setting. It was good to be in a holiday resort where you don't need a car hire. Paul helped organise a airport transfer and then both the local taxis and the boat taxi were a cheap and quick way to get into Kalkan town centre. There are plenty of firms offering reasonable priced day trips if you want to explore the area further. We fell under the spell of beautiful Kalkan and the lovely Villa Angora and we would love to return someday. From our very first communication it has been a pleasure to have you stay with us! So very happy your transfers all went well and the holiday in our gorgeous Kalkan and villa was everything and more of what you expected! A fabulous once in a lifetime luna eclipse a special gift. We missed it being on the otherside of the world sadly. We look forward to having you stay with us again and wish safe travels! Stunning view, warm welcome, all the amenities I could possibly need. Two and a half glorious weeks at Villa Angaora and it was heaven. The owner arranged a driver to pick us up at Dalaman Airport, drive us to the villa and then deliver a hire car the following morning. The very model of efficiency. (He also drove us back at the end of the trip at 5.00 am for an early flight.) The villa is wonderfully appointed with full kitchen (including washing machine), TV, DVD player and plenty of room to spread out. The description on the web-site is accurate and so there were no disappointments. The most wonderful part is the location. Near enough to the town of Kalkan to feel its ambiance and get to conveniently but far enough removed to avoid the noise of the bars and restaurants. And the view,,,You could spend the whole day just drinking it in. If my schedule allowed, I would return to Villa Angora in a heartbeat but unfortunately, I'll have to wait a year! Thank you for the very generous and welcome review! So very happy you had such a wonderful time at Villa Angora and with the fabulous people of Kalkan. So many of our guests have experienced the same reaction to their holiday and we look forward to many repeated visits back to that lovely part of the world and a stay with us! The nearest sea access to the villa is 300 metres, but wonderful sandy beaches can be found at Kaputas - 10 minutes by car, and Patara - 20 minutes by car. There is also a clean shingle beach in Kalkan itself. Watersports are available at the nearby Kalkan Beach Club - 300 metres. Other Beach Clubs are accessible via Kalkan Harbour, and local Gulet trips are thoroughly recommended. Flying time from Gatwick Airport is just 3 1/2hrs to the nearest airport of Dalaman, which is 1.5 hours drive away from Kalkan and is served year-round by Thomas Cook, and seasonally (May-October) by EasyJet, plus all the usual charter airlines, First Choice, Monarch, Thomsons etc. Airport transfers are recommended with 'X-Press Travel' hire cars are available. A car is not totally necessary for your stay in Kalkan, but is recommended for exploring some wonderful ancient sites within easy reach. Kalkan Harbour is 25 minutes away on foot, 10 minutes by water taxi from the Beach Club just below the villa & costing only 10TL (£3) per person round trip and just 5 minutes by taxi at £5 each way to town! Kas (pronounced 'Kash') the next large town with great markets and food is 30 minutes by road, and Fethiye is 45 mins. The walk into town is for those in really good shape, we highly recommend the water taxi, which runs all day, found for a leisurely ride into the town centre. There is a local shop just up and behind the villa called 'Bob's' providing basic essentials, (he has a good restaurant there also saving a trip into town!) but serious food shopping is in Kalkan which provides at least 4 excellent supermarkets selling all the familiar items. The largest being Yali Supermarket near the banks. There are chemists and hardware stores with great green grocers for fresh fruits & veggies and a butcher! With two small restaurants & bar along with a small grocery store just 2-3 minutes up the hill behind the Villa, guests have no need to leave the neighbourhood for days if they wish! A full information booklet in PDF form will be sent with rental confirmations! Booking Notes: A non-refundable deposit of 25% is required at time of booking, with the balance being paid 6 weeks prior to departure. Cancellation charges : up to 6 weeks prior to departure - loss of deposit. Between 6 and 2 weeks - 50% 2 weeks or less - 100%. Clients must make their own flight arrangements and airport transfers, but we can assist with transfers and car hire if requested. Bookings are limited to a maximum of 6 persons only. Changeover Day: Changeover day is flexible (subject to circumstances) but is normally Monday. Check-in time is from 2pm, and check-out is 10 am, but these times can possibly be revised with prior arrangement, if circumstances permit.